Sysessential for OST to EMLx software is an efficient tool that ensures quick conversion of OST data into EMLx format. The software does the complete conversion of OST data and the data include emails, folder, contacts, task, attachments, etc. The software ensures fast conversion of data from OST to EMLx format. While converting the file format of email file from offline OST to EMLx software, software make sure that no data is lost during the process. Batch conversion of data is also possible with this efficient tool. The structure of OST file also does not get changed when the conversion is done. The mailbox structure remains the same. The folder hierarchy does not get changed while changing the format of OST file to EMLx. The software is supportive to OST file created from any version of Outlook. It is also supportive to OST file of any length, the only condition is that, it should not be corrupt or damage. The software Sysessential for OST to EMLx is supportive to Windows and it works flawlessly on all versions of Windows such as XP, Vista, 2000,2001, 02 up to the latest in use. The meta information of email such as To, CC, Bcc, From, Subject, Time, attachments stays intact with the email data. No changes are made in the meta information, when data is moved from OST to EMLx format. There are only two requirements present for the conversion of OST data to EMLx form. The requirements are OST file and the machine having Sysessential for OST to EMLxinstalled. 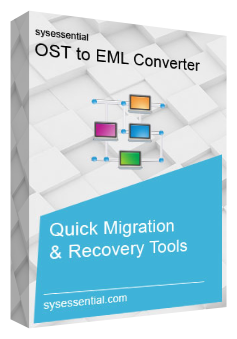 With the help of this super efficient tool, you will be able to convert the data of OST file into the EMLx format without fail. It convert entire data of OST to EMLx format and the data includes email, calendar, tasks, created folders, attachments, metadata, contacts, etc. When an offline OST file is uploaded in the tool, it quickly scans the file and give the preview of items, which need to be converted. Now, from the list user can select the items which he wants to move to a new format. The Sysessential for OST to EMLxis capable of converting multiple offline OST file into the EMLx format at a faster rate without any hiccups. With the multiple conversion as well, the software’s work speed does not get impacted. The software has the preview option, which allow users to see the data which is being converted to different format in real time. The preview option is very helpful in gauging the conversion process in the real time. The software is willing to convert any length of OST file into the EMLx format. There is no restriction to the file size. The resultant EMLx file can be accessed in Apple Mail. If you want to test the features of the software before buying, then get the free version of it. The free version of software will give you guidance about the key features and data, which it converts. Can I install the Sysessential for OST to EMLx software on my Mac system? The software is compatible with Windows Operating System. It does not work with Mac OS. The software can be installed in any system that has a Windows OS of any version, but not the Mac OS. How can I buy the software online? To purchase this efficient tool, all you have to do is click on the option “Buy”. The option will take you to the next window, where you can make the payment and get all the license of software. Moreover, the support team of Sysessential is available for your assistance all the time. Whom I am suppose to consult if I get any trouble while working with the software? Sysessential has a solid team of technical support people, who work round the clock to support its clients. If you face any trouble at any point of time, you can get in touch with them to get necessary assistance. Do I need the Outlook environment to convert OST file into EMLx? For converting the data of OST file into EMLx format, all you need to have is the OST file and the software. The Sysessential for OST to EMLxwizard does not require Exchange server as well as the Outlook to attempt the conversion. Do I need to take the corporate license to convert bulk data? The home or personal license has certain limitations for bulk conversion of data. On the other hand, the corporate license does not have any such limitations. Users are allowed to install it on multiple machines and convert numbers of files. I have the habit of working on OST file, as the internet connectivity at my residence is not proper. I used to create the OST file and convert it to the PST file when I go back to my office and regain access to my mail content. But, the last time, I wanted to access the OST data in AppleMail. I tried many manual processes to change the format of OST to MBOX or EMLx format, but was failing to do that. Then, while surfing the internet, I encounter Sysessential for OST to EMLxsoftware. I immediately installed that software in my machine and launch it. The software all the data present in the offline OST mailbox into the EMLx format, without any data loss. When my office changed our email client environment and moved from Outlook to Apple Mail, we lost Outlook access. I had a personal OST file, whose data I wanted to convert into Apple Mail supported file format. I got to know about the Sysessential for OST to EMLxsoftware. I took the help of this tool and converted the data. The software helped me a lot to convert all the data of the offline OST file to EMLx format. And after the conversion, I was able to access the OST data in Apple Mail without any trouble. Not only this, EMLx format also allowed me to access the Outlook mail data in many other platforms.